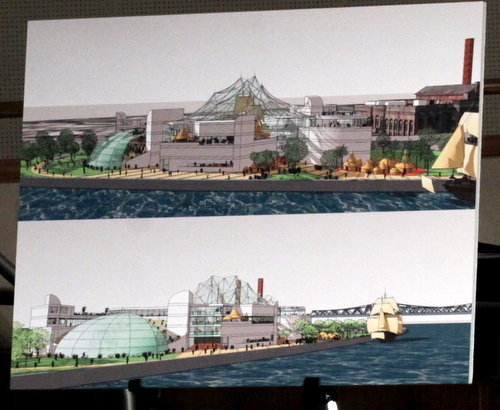 Described as a dream decades in the making with a vision that spans millennia, a museum built around a full-size replica of a slave ship is being planned for a site in the Lower Garden District riverfront near the former Entergy substation. Lloyd Lazard, who has bee spearheading the project since the mid-1990s, architect Clifton James, Xavier University President Norman Francis and several supporters presented their proposal to the City Council’s Special Projects and Economic Development Committee. James brought a rendering of the multi-story museum to the meeting, but the project is still very much in conceptual stages, Lazard said. The project would be located at Celeste Street, and organizers envision it as part of the city’s complete reinvention of the riverfront, from Poland Avenue downtown to Jackson Avenue in the Uptown area. The project is called the National Slave Ship Museum (on a similar scale to the $110 million National Underground Railroad Museum in Cincinnati), but it is international in scope. The core of the museum would be a drydocked replica of an 18th-century slave ship, with an amphitheatre and other features built around it. Many of the performers there — as well as the cuisine in the cafes and the wares for sale in the gift shop — would come from Africa, Lazard said. Other features include an on-site DNA lab that would enable visitors to trace their ancestry back centuries. Inside the replica ship, one exhibit would be a simulation of the conditions on the terrible voyage across the Atlantic. And, in a second phase, a sea-worthy version of the ship (with modern safety features) would actually take visitors onto the Mississippi River — Lazard hopes to model it after the Antelope, a slave ship whose capture off the coast of Florida in 1820 led to a Supreme Court case on the illegality of the international slave trade. So the tale of the African Diaspora would be central to the museum, Lazard said, but its concept would be even broader. Slavery has existed in many cultures throughout the world, Lazard said, mentioning stories from the Old Testament, as well as the use of slaves by the Romans, conquering tribes in Asia and even Africans enslaved by other Africans. Incorporating that history, he said, would give the museum a universal outlook that could appeal across cultures similar to the Holocaust Museum in Washington D.C. or the World War II Museum here in New Orleans. “One component of it is incredible horror and destruction, but they’re mostly places of hope and victory and heroes,” said Michael Mayer, a West End boat builder. Lazard traces the genesis of the slave ship project back to a 1994 Act of Congress establishing an African-American Heritage Corridor. He began advocating for the slave ship museum then, and in 2001 he received confirmation from the U.S. Department of the Interior that his vision would be a good fit for the corridor. In 2005, he received a $25,000 grant for a feasibility study that began looking for a site and comparing the project’s operations to similar museums. “This is not a wild idea, but it’s something that makes a lot of sense and it’s time has come,” Lazard said. City Council President Jackie Clarkson said she had been supporting Lazard’s efforts for years. City Councilwoman LaToya Cantrell compared the project to the search for an “iconic” structure on the river at the base of Canal Street. The sailing ship in the museum, she said, could serve that function as the city plans toward its tricentennial in 2018. “New Orleans is the only city in the country that can be home for this slave ship museum,” Cantrell said. 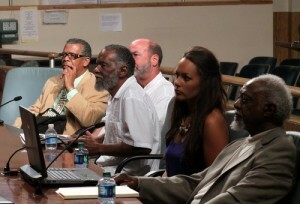 City Councilman James Gray emphasized the academic aspect of the project. Lazard mentioned that he envisioned it as bringing together different departments and researchers from all of the city’s universities, and Gray said the knowledge created by their work would be another major benefit of the museum. The Xavier University president agreed. “If you don’t tell your own story, somebody else will tell it for you,” Francis said. Because the riverfront redevelopment is a joint project of the city and the port, Lazard said he needs the blessing of the City Council so that he can move forward seeking private investors. After the meeting, Clarkson said any council action on the project will come from Cantrell, since it is in her district, but that she expects the full council to support it. “Of course we will be part of it,” Clarkson said. Wow what a great idea! Though I wish it would go close to the the CBD or FQ. Maybe on the river opposite the French Market. Wow, almost two decades in the planning and not a word about funding, what a great report. Why does it seem like this will require a government subsidy of enormous proportions. As far as a DNA test that can by itself on the spot trace your ancestory back centuries, that is absurd. But they could charge a fee and tell everyone they came from Africa about 30,000 years ago and they would be safe. And a functioing sailing ship on the Mississippi, that seems like a great trip, they will probably have no problem going down river every day, but it may be afew days before the winds are right for a retun to the dock. Museums usually come from government subsidy. That’s the way civilizations work. It contributes to the common good. If you want to live in a society that doesn’t support museums, move to Somalia. Your comments about the sailing ship on the river are right on, though. Today they are reporting this will cost $170 million, what tax payers are going to support this scheme? How much will the subsidy be? We subsidize the New Orleans African American Art Museum, which has few visitors, is mired in scandal and mismanagement and generally closed. The much less grandiose National Slavery Museum in Virginia is bankrupt. This is a project with little or no planning beyond a few sketches and no prospect of success. No mention was made of any resources other than their large ideas. The only real question is how much do the tax payers get soaked for the planning. The problem is that you define success simply as making money. Entities like museums, public transportation, schools for your children – they are not supposed to simply make money. The view that government should make money is flawed to the root. Wars don’t make money, building bridges and roads doesn’t make money. But all of this enables people to create enterprise, understand culture, perform simple maths. All of that is important in a civilized society. So, in reply, who cares if the museums go “bankrupt”? It is hard to even understand what that means. this is actually a great idea for uptown. But, why can I see some residents complaining already. There are people in that area, that would rather have vacant buildings. This really could be the next WWII museum Where else can you go and see a replica slave ship that is actually docked in the river. The Rouses on Tchop is where slaves were loaded and unloaded when they were sold. This is the opportunity to show everyone in the world that NOLA is different. New Orleans really is a city full of history. This is just another reason to make tourists stay and extra day and spend tourism dollars uptown instead of the FQ. If the residents don’t want it, I guarantee kenner will take it and just add it to the Rivertown attractions. Will be a boondoggle & lose millions of taxpayer dollars. Zero chance that gets privately funded. “If you don’t tell your own story, somebody else will tell it for you,” Francis said. Councilman Gray emphasized the academic aspect of the project. There is also an academic aspect to every historical monument built in the United States. Good AND Bad! Look at the Trail of Tears in Tennessee (Andrew Jackson) and then come to New Orleans and see a City saved by this same man. How about Thomas Jefferson? His family were slave owners. Although he did not advocate slaves, his slaves were treated more harshly when he (Jefferson) was at the Capitol. Yet, this intellectual man WROTE THE DECLARATION OF INDEPENDENCE. It is HISTORY and, like the Holocaust, should never be erased or ignored. If these monuments are a nuisance in nature, how is this museum not going to be a nuisance. Why is New Orleans the only city? It is my understanding that New Orleans was never a port of entry for slaves into the United States… instead, Boston MA was… why wouldn’t Boston be the only city in the country that could be the home for the slave ship museum? Isn’t this the same argument that is being made by the supporters of Lee Circle and such? I love all the comments about New Orleans being a city about history and it also being a museum. These comments coming from the same idiots wanting to tear down monuments in the city. Talk through both sides of your mouth much?